Hey girl hey! I feel like I say this ALL the time but it has been a hot minute since I have written a "Wear It Wednesday" post. I have been busy working on campaigns that I have put blog posts to the side which is not cool! I am going to get better at writing blog posts. 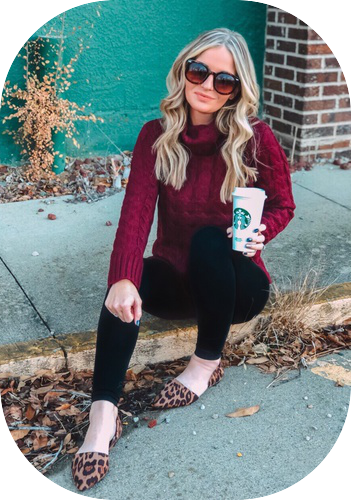 There is SO much more than writing blog posts when it comes to being an influencer on top of being a wife and mom of 3. I am going to stop with the excuses and just start writing again because I truly miss it! Enough about that, let's get to why you are reading this...styling a camo jacket 3 ways! The first way I have styled this jacket is with a pair of denim and a striped tee. Doesn't get easier than that. Don't be afraid to pattern mix! It is my favorite! For shoes, you can wear a pair of cute booties, mules, or sandals depending on the weather. Easy peasy! Second way to style this cute camo jacket is even easier! I just paired it with a simple black dress. Again, you could wear a pair of cute booties, mules, or sandals depending on the weather. You could also wrap the camo jacket around your waist for a more casual look and if it's still warm where you live. Last, but certainly not least, is my favorite! It's my favorite because it the comfiest and includes leggings! For this look I paired the camo jacket with a pair of moto leggings and graphic tee. Instead of actually wearing the jacket, I wrapped it around my waist for a little extra booty coverage ;) and to "cute-n" (I just made up a word) this look. I would pair this look with a pair of sneakers or you could wear a pair of casual sandals. Now how do you feel about the camo trend and how to style this jacket? I hope better! You got this girlfriend! Go style that camo jacket and own it! If you try one of these trends, tag me on Instagram or send me a DM! I love seeing when ya'll buy something that I suggested. Have a happy hump day, babe!